Rennel Rodarmel Agency had its start in a booth inside the Sears store at the Lycoming Mall. Now we have two locations, Williamsport and Mansfield. The Williamsport area has been my home for the majority of my life. It has been wonderful raising my two sons and seeing my grandchildren grow up involved in all the activities available here. When I started my career, one of my goals was to achieve Hall of Fame status. Looking back on a very fulfilling career, receiving the Allstate Financial Hall of Fame award was a great honor. As is having my two sons, Rennie and Richard, at the agency here with me. We are all sports fans and enjoy the outdoors very much. Williamsport is the home of Little League, so of course, baseball is a big part of our family, from Little League to Legion Baseball. As is wrestling, myself being a former coach in Williamsport and Hughesville. One of my sons was a State Wrestling Champ and played minor league ball. He is following in my footsteps and is coaching as well. Even though I am more of a laid back golfer, I enjoy golfing at our local course in Lockhaven. 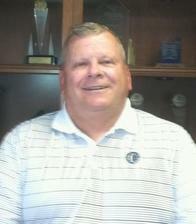 I am an avid hunter and enjoy many outdoor activities in the Mansfield area with my sons and grandchildren. Being involved in this community is important to me, I am proud to say that the agency sponsors many events. Some that I am most proud of are the Lockhaven Division 1 Wrestling program and Lycoming College Homecoming Golf Tournament. One of the highlights every year is when we sponsor a Hall of Fame baseball player to come in for an autograph signing during the Little League World Series. We support a local radio show and the local sports channel which is close to my heart because it allows seniors and grandparents who might not be able to attend in person watch the games. For me, being there at a time when people need you, letting them know that we care is why I come to work every day. I am particularly proud of the staff here at the agency, they are very caring and committed, always ready to pitch in at a time of need. Please stop by the Rennel Rodarmel Agency, anyone here at the agency would be happy to sit down with you to discuss how we can help protect what matters most to you. 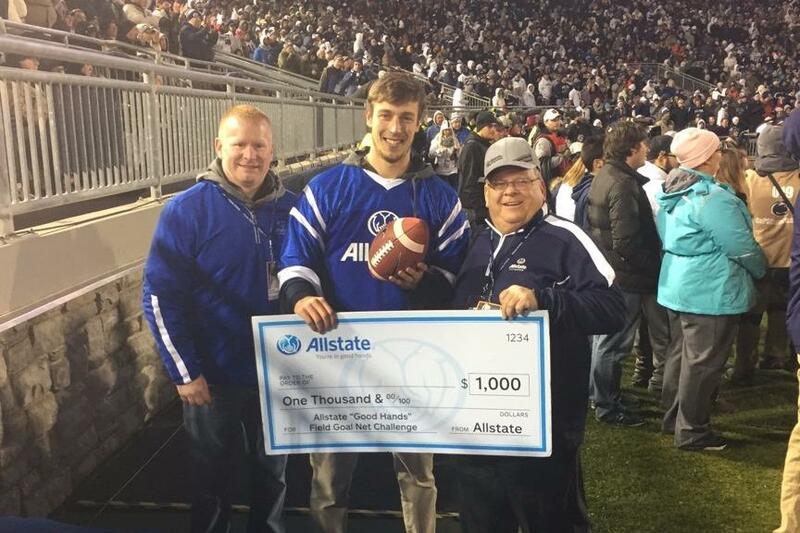 Congratulations to the fan that made the 25 yard field goal! 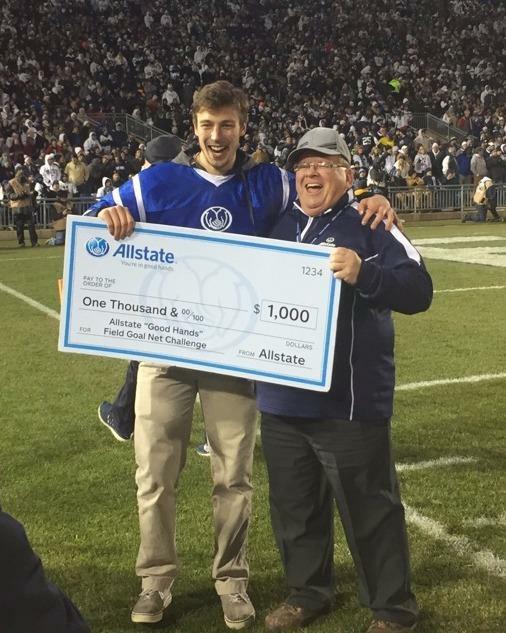 The Rennel Rodarmel Agency would like to say CONGRATULATIONS to the fan that made the 25 yard field goal at the Penn State vs. Michigan State Spartans football game! 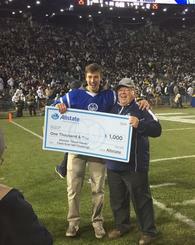 He won $1,000 and two tickets to a future game. 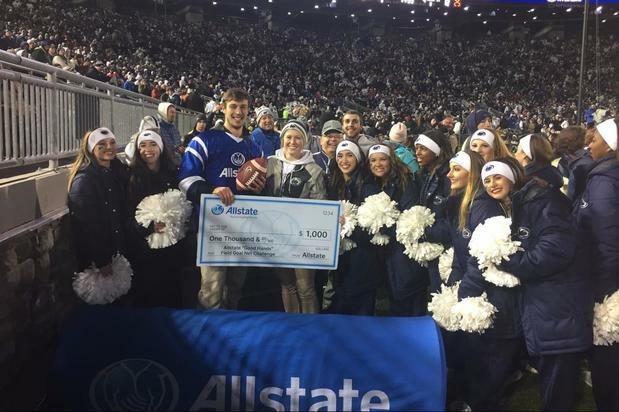 Plus an additional $1,000 donation was made to the school’s general scholarship fund from the Allstate “Good Hands” Field Goal Net Challenge.